MICRONA™ Bedding Lime is perfectly suited for animal bedding needs. 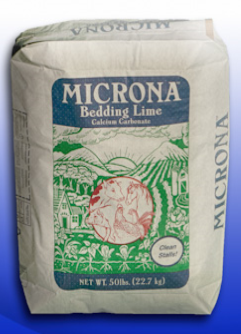 MICRONA™ increases sanitation, reduces odors and can help you decrease bedding cost by up to 30%. This economical and environmentally friendly product is harmless and non-toxic when used as directed. Unlike hydrated lime, it will not burn. Apply MICRONA Bedding lime in your barn, and guess what? You now have added calcium to the compost that was created from cleaning your barn.